Few people ever experience the crucible of war: the stench and sounds of combat. The threat of death delivered by sniper fire. The stretches of numbing boredom alternating with paroxysms of adrenaline-wired violence. Few see it, but those who do are changed. “In war there are no unwounded soldiers,” said Argentinian writer José Narosky. 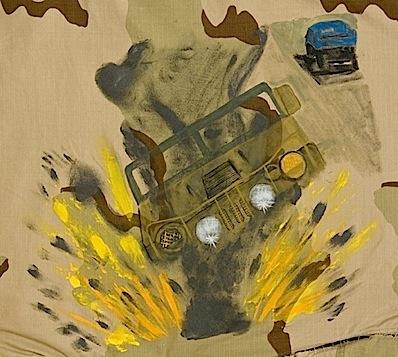 Iraq veteran and artist Rick Lawson is no stranger to war’s unseen effects. His first-hand knowledge of how combat duty may subsequently alter the lives of military veterans inspired him to create the War Experience Project, a unique program in which service members paint their stories onto uniforms. Lawson, a Bellingham resident, was a specialist with the Washington National Guard in Balad, Iraq, from 2004-2005. He says that like many soldiers, upon returning home he had trouble answering the often invasive questions friends and even strangers had about his combat duty. While settling back into civilian life, and seeking direction, he enrolled at Western Washington University – a turning point. That first painting session was the genesis for the War Experience Project, which seeks to help veterans who have served in any of the world’s conflicts to process their memories through painting. Lawson says that the art workshops, conducted in a private setting, offer an intuitive outlet for soldiers who find it difficult to verbalize their experience. Spaceworks Tacoma is supporting the project with a three-month residency at 906 Broadway; the exhibition will open on Veteran’s Day, Nov. 11, with a full day of activities from 10am – 6pm. Lawson says that Tacoma’s proximity to Fort Lewis and the Puget Sound Naval Shipyard, in Bremerton, gives this exhibition special relevance, and he encourages military service members to participate. His personal, war-related art has been shown in Canada and the UK; the pieces compiled for the War Experience Project may travel the world. The War Experience Project, 906 Broadway, opening Nov. 11, 2010. Thanks for your question. You should be able to subscribe to the Spaceworks feed by clicking on “RSS” (in the right-upper corner of the blog, in red, right next to “Apply”). Once you do that, another page will open up and there should be a link you can click on to subscribe to our feed (near the top of the new page). Click on this, enter in the appropriate information, and you should be all set! Thanks, and visit us again.